RUSH: It’s a sad day for the Limbaugh family. My Aunt Anne passed away very early this morning, natural causes, a long illness. She’s the wife of my Uncle Steve. They lived in St. Louis. He was, until his retirement, a federal district court judge, Eastern District of Missouri. His son, my cousin, is now that federal judge. But Anne, when I turned 16, it was a big deal to get your driver’s license, and you know what became of that? I became the official Limbaugh family deliverer of Meals on Wheels. She insisted on it. 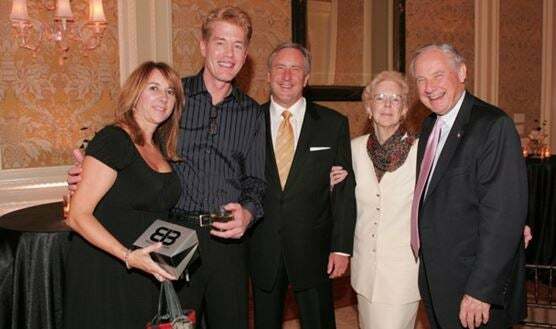 Aunt Anne with her husband Steve, her son Steve, the late Kit Carson and his wife Theresa. “Okay.” So I’m delivering Meals on Wheels. I’d never heard of it, I’m 16 years of age. The point of that is that she was charitable to a fault. She was selfless, and she didn’t suffer fools. And in her family, she didn’t permit them. (laughing) It was just a force of nature. She’s always been so supportive of me, even when it was challenging to do so. She led a full life. She was one of the grande dames of the family, a genuine matriarch, and she’s going to be sorely, sorely missed. She and her husband, my Uncle Steve, married well over 50 years. And these things happen. I’ve always said I look forward to getting older, and the day has not yet come where I regret that. Every year so far has been better than the day before, but the older you get, death is something that’s more frequent and more common among your family, your circle of friends and so forth. It’s unavoidable, obviously. But she was just a great lady with impeccable taste and a wonderful personality, always smiling. She was inspirational to everybody who knew her, Anne Limbaugh. I had to mention this because I consider all of you part of an extended family, and I have the great opportunity here for all of you to know, to a certain extent, members of my family. We’re very proud of each other. So it’s an opportunity for me, and I appreciate your indulgence while mentioning this. RUSH: I got an email during the break. “Rush, about your aunt who passed away, your Aunt Anne, was she supportive of you even during the worst times?” Yes. Folks, that’s the thing about — I’m sure it’s your family, too, but in my family, and, believe me, I’ve tested ’em. My family is typical Americans. They’re head down, steam ahead. They’re not into anything for public adulation, recognition of any kind, and yet they’ve always been supportive. Anne used to write me notes constantly encouraging me, applauding me. She listened every day, and, if she heard me say something she thought was especially poignant or smart, she’d fire off a note and tell me. Those kinds of things are invaluable, getting support like that, and she did that with everybody in the family. She was funny as she could be. Her husband and her son became oenophiles. You know what a oenophile is? That’s a wine aficionado. They have their wine club and they would have monthly dinners and tastings of the best wines they could get a hold of. And Anne would say, “Just give me the cheap stuff so I can put some ice in it.” Like my mother. My dad bought a Cadillac once. My mother refused to be seen driving it. She’d ride in the thing, but she didn’t want to be seen driving. (laughing) She didn’t want the town to get the wrong idea. It was all lighthearted and good fun, but she always reminded you that she was the aunt and you were the nephew, in a funny and humorous way. But the support that I’ve had from all of my family through all of this has never wavered, and she was right there at the top of it leading the effort. I’m gonna miss her tremendously because she was one of a kind. She was confident. The older I get the more that impresses me in people as a really valuable attitude. Genuine confidence is often the thing that opens doors, coupled with desires. But, yeah, she was constantly supportive.